It looks like Rahul is trying our patience.Today, when he was in full flow, looking set for a perfect ton, he got out off a pretty ordinary delivery from Ryder.With a massive 619 total to chase, it was necessary that one of the players plays an sheet-anchor role, making sure that he builds partnerships with others.Rahul was doing this job pretty well, but the match-hero Jesse Ryder shattered his dreams. 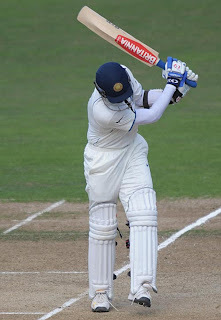 First, Rahul shared a little 25 run partnership with Gambhir before later gave his wicket away.Then came the little master. Both started playing like seniors and Kiwis had no choice but to wait patiently for one of them to make mistake.The partnership was crucial in deciding the fate of the match.Finally, Sachin made a mistake and a good 87 run partnership was broken.With a last hope for Team India, Very Very Special Laxman arrived at the crease.Rahul built a good 81 run partnership with him, but couldn't hold his nerves on a short delievery outside the off-stump. After Rahul got out, Yuvraj and Karthik could not survive longer.Laxman, on the other hand, tried to put up a fight, but lost his patience when the wickets started falling quickly. Kiwis have forced a Follow-on and look all set for a huge win.